While I was not able to get on and into space last night, Gaff kept me appraised of the situation through some running commentary on IM. And, of course, all the Jabber pings were queued up on my iPad as well, so I could see what fleets got called when. 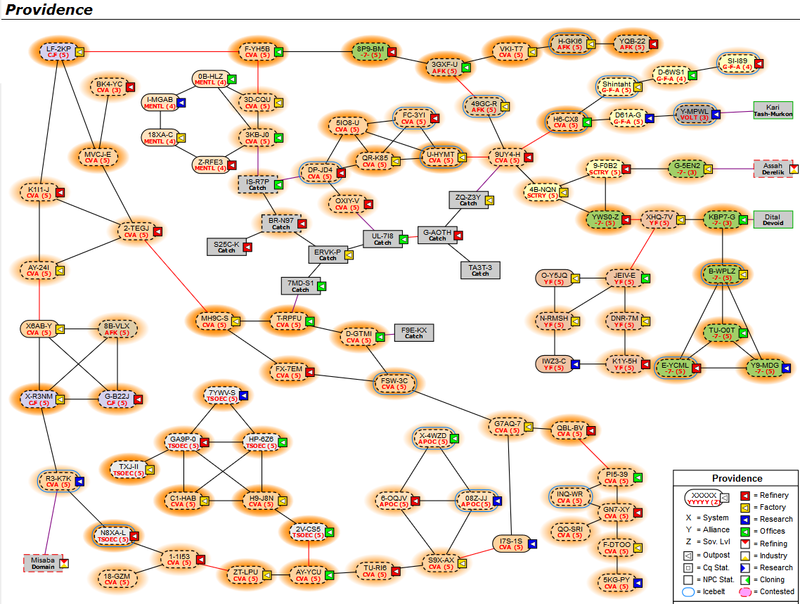 Here is how the region looks as of this morning, systems with structures in a reinforced state highlighted in orange. You can compare that with the maps in yesterday’s post. Again, not all the systems in the region have been successfully reinforced, with only 75 of 83 ihubs being hit. (One system in the region does not have an ihub, so 84 systems but only 83 ihubs.) And, as noted yesterday, there is a correlation between high ADM numbers and not being put in a reinforced state. Fights looked to be a common occurrence, with the locals rising to challenge the invaders on a regular basis while third parties roamed the region looking to join in. 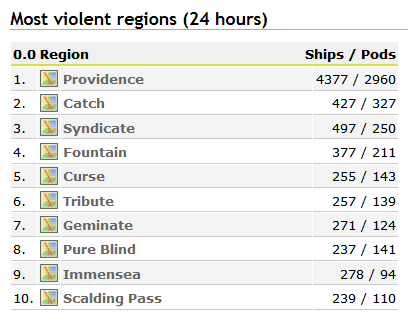 Over at DOTLAN EVE Maps, systems in Providence have dominated the “most violent” list for null sec, while the region itself leads in that competition by a large margin for the last 24 hours. Basically, more ships were blown up in Providence than the next nine null sec regions combined. Not bad for a patch Tuesday I guess. As day four of the invasion commences the first structures will start coming out of reinforcement and the Fozzie Sov Entosis Link mini-game will begin. The real tally for the campaign will be how many ihubs get destroyed during this phase. This will also be the first real test of the Fozzie Sov changes that came in with yesterday’s Galatea expansion. Meanwhile, back home in Tribute, Mordus Angels used the Euro time zones, when much of the action was happening in Providence, to put structures in four more Tribute systems into a reinforced state. This includes three more Circle of Two systems as well as 0-YMBJ, the one Goonswarm system in the region. That brings the total up to eight systems in Tribute where MOA has put structures into a reinforced state since the Providence campaign began. An emboldened MOA also started in on some systems in Pure Blind, which was previously their focus. They managed to reinforce a single system in the region. A US time zone op was formed to chase them off, consisting of a Dominix fleet with triage carrier support. While I have not seen an after action report yet, the battle report that zKillboard generated shows MOA deploying some dreadnoughts and taking out four carriers and nine battleships, along with other sundry kills, for a total of nearly 12 billion ISK destroyed. MOA losses tallied up to less than 400 million ISK. As a result all US time zone pilots in TNT have been recalled to Tribute. The timer for the station in UMI-KK, the alliance capital, will come out in in the evening US time today and we are expecting for form up a much larger force to defend it. This entry was posted in entertainment, EVE Online, Null Sec and tagged I Was Not There, Provi War, Providence, Pure Blind, Tribute on August 26, 2015 by Wilhelm Arcturus. Enjoying these reports, keep em coming. Pingback: Das Imperium schlägt zu (rück) – Providence War – Dark and harsh world.